Today is National Cream Cheese Brownie Day. 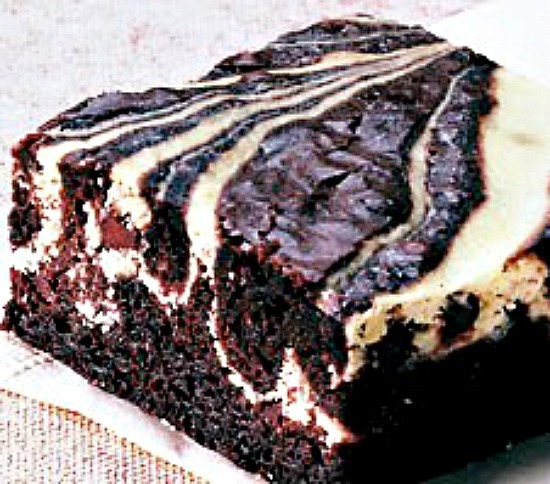 Here's a great recipe for Double Chocolate Cream Cheese Brownies. Philadelphia Cream Cheese is usually my cream cheese of choice since I grew up in Philly, but I've been known to substitute local rich California Cream Cheese. The extra dark chocolate chips are a great addition to these Cream Cheese Brownies, and you can actually add more than 1/2 cup. I chop up high quality chocolate rather than chips, but either works! Celebrate! Make Double Chocolate Cream Cheese Brownies today or make some for Valentine's Day. You can never have too many brownie recipes! Line 9 x 9 inch square baking pan with aluminum foil across the bottom and up two opposite sides of the pan. In stainless steel bowl placed over a saucepan of simmering water, melt butter and chocolate. Remove from heat and stir in sugar and vanilla. Add eggs, one at a time, beating well after each addition. Use a spoon. Stir in flour and salt and beat, until batter is smooth and glossy and comes away from the sides of the pan (about a minute). Remove 1/2 cup of the brownie batter and set aside. Fold chocolate chips (or chopped chocolate) into remainder of brownie batter and then pour batter evenly onto bottom of prepared pan. Using mixer or food processor, whip cream cheese until smooth. Add sugar, vanilla, and egg and process just until smooth. Spread cream cheese mix over brownie layer. Spoon small clumps of reserved brownie batter on top of cream cheese filling. Then with knife or wooden skewer, swirl two batters without mixing them. Bake in preheated oven for 25 minutes or until brownies start to pull away from sides of pan and edges just begin to brown. Refrigerate brownies until firm enough to cut into squares (at least two hours). Once chilled, remove brownies from pan by lifting with ends of foil and transfer to cutting board. Want to try some variations on Cream Cheese Brownies? BROWNIE BAKED ALASKA: IT'S THE BOMBE!